Last week, I had the great pleasure of attending the White House Office of the Vice President’s “It’s on Us” Summit. 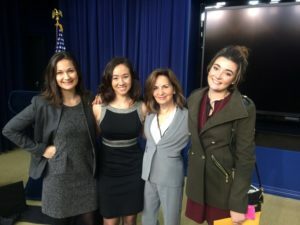 Attended by a constellation of anti-sexual violence allies, from survivors, to elected officials, social media celebrities, and athletics officials, this event was a celebration of the progress that we have made as a movement, since the White House Task Force to Protect Students from Sexual Assault was formed three years ago. In one of his final public addresses as Vice President, Joe Biden spoke passionately about his plans to continue to serve as an ally in the field by creating an anti-sexual assault foundation. On behalf of PreventConnect, and as a survivor, #ThankYouJoe for your leadership and dedication to ending sexual assault. To read more about the Summit and the White House’s work to end sexual violence, see our blog.